With such a large family it takes a lot of planning and preparation to feed everyone. 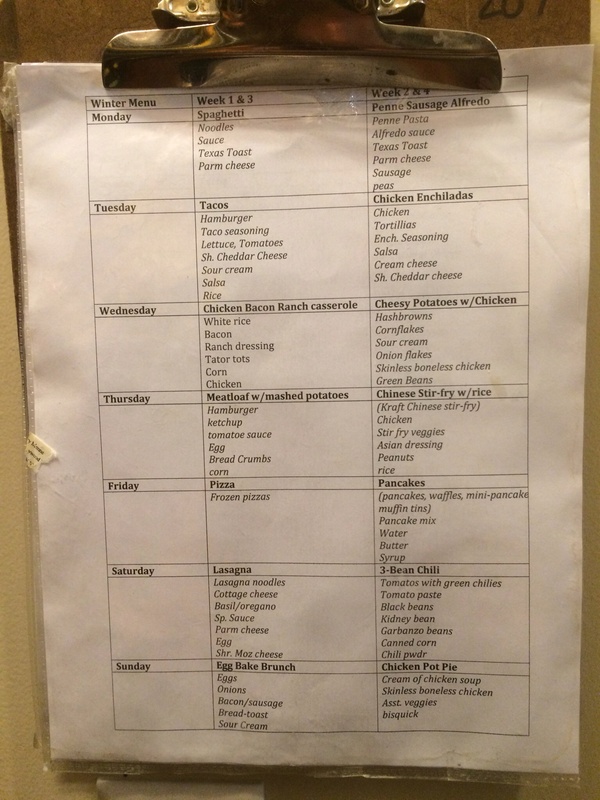 I never thought I could get behind a meal planning calendar but for budget’s sake it needed to be done. I had the kids sit down with me and plan a 2 week rotating calendar. We do this in the fall for a winter meals and again in the spring for summer meals. If I or the kids decide a particular meal isn’t working we just change it. 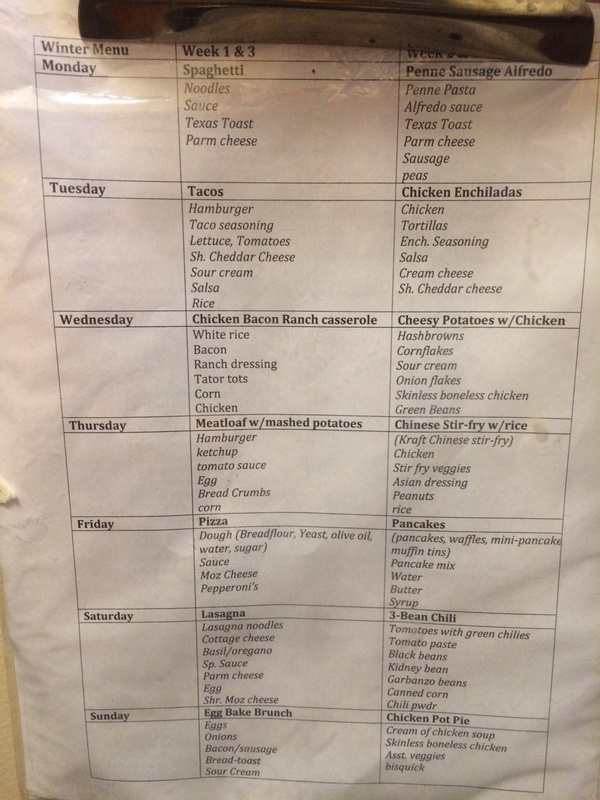 I have the menu on a clip board in the pantry to whomever has the kitchen for their chore that month can get out the ingredients and possibly prep. Under the menu I have the recipes for those meals clipped as well. Below that clipboard hangs another one. This is the special ‘shopping’ clipboard that has a lovely spreadsheet clipped into it. 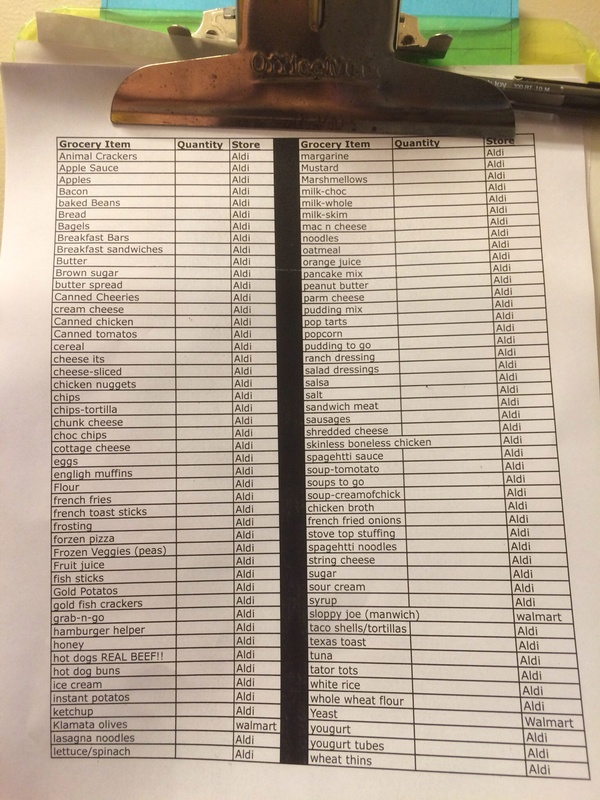 (Yea, there are probably a few post-it’s on there too so I don’t forget to add things) The spreadsheet includes items we typically buy in alphabetical order as well as a separate list of what I call the ‘target’ items (toothpaste, diapers, etc.). I don’t buy all of those things at Target (after all we are talking cheap) but that seems to sum up the contents of the list for our family budgeting purposes. As we run out of things we can simply mark it on the spreadsheet or add it to the bottom. So each month when we go shopping (yes, it’s a monthly trip) I bring along a clipboard with the items needed highlighted in yellow and as they get tossed into the carts (yup, we require at least 2 carts) I can cross them off with a blue marker. I am a BIG FAN of Aldi although most folks think we shop at Sam’s Club or Cosco. The reality is those stores are great for some items but the vast majority of the grocery items are cheaper at Aldi and I can get the family in and out quicker because it’s a smaller store. (They carry all but a couple items on my list it’s just that they don’t carry a bunch of different brands of the same product) What works best for us is bringing 2-3 quarters for carts, 6 laundry baskets and a baby carrier. I can do all the shopping on my own if I put the little one on my back and the toddler in a cart and have one of the older kiddos push the second cart. 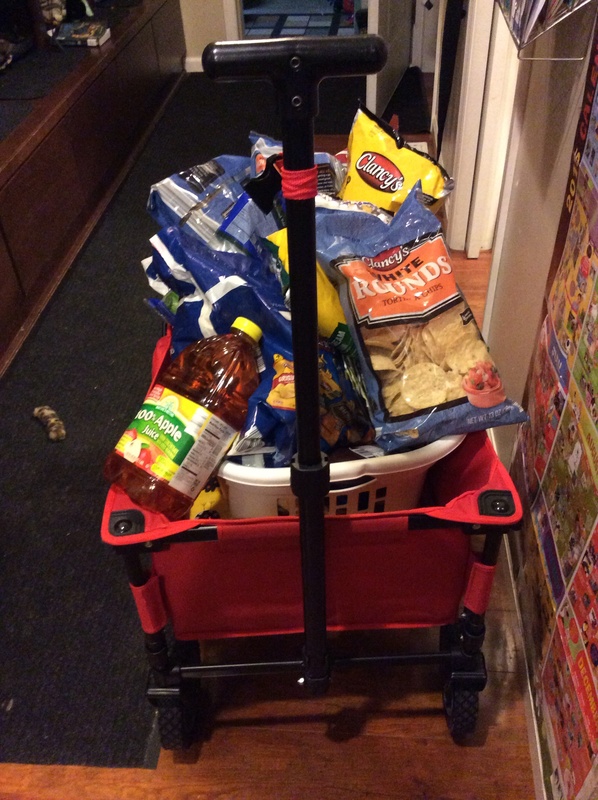 The Kids are great at helping put items in the cart and have gotten accustomed to how this operation works. We discuss our budget with them and how that whole process works in hopes that they will be fiscally responsible adults. They have fun trying to estimate the cost at the register. We purchase most of our groceries at Aldi, a few at Walmart and Sam’s club. I try to get most ‘Target’ budget items at the Dollar Store or Walmart. I also LOVE the thrift stores. I have a big selection of thrift stores to shop at and love that I can find treasures at a great price and the little ones can always find a toy of $1 or less. 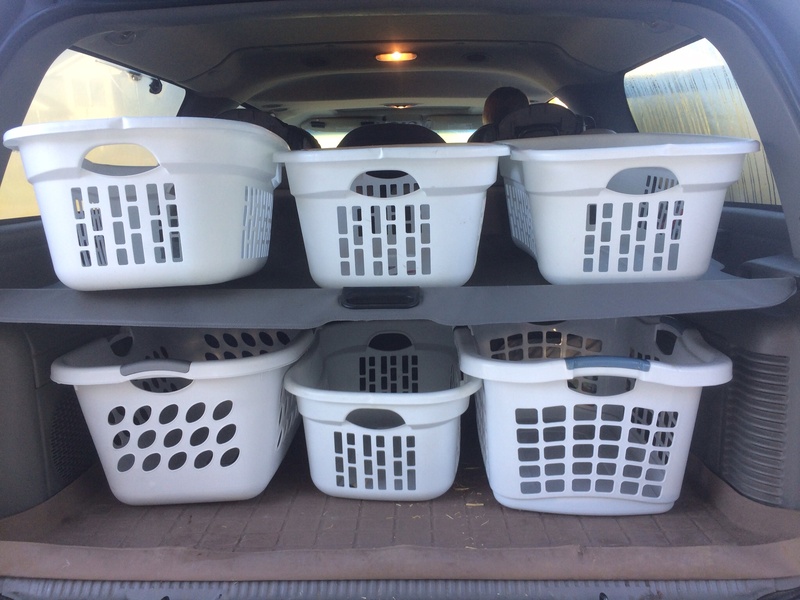 When we get home those baskets then get unloaded one at a time placed in a super cool wagon and wheeled up into the kitchen. To get up into the house through the service door I use a ramp my hubby made for the kids to ride their bikes over but it works just fine for my needs. I can get the whole suburban unloaded fairly quickly this way and the organization helps so I can get the cold stuff put away and take my time getting the rest put away. I’d love ideas from other large families. How do you do it? Any tips for me?